I'm sticking with my red hat and gloves for work outerwear, which means red and purple color combo. I like it, did I tell you I read this thing about how many colors you can put in one outfit? I love rules, you can put three. Black and white count as half. As somebody who has mostly clung to black + color, this is an exciting step into full traffic. Eeee, can you see my new hair? This one is called a graduated round, I think I like this one the best so far. I think I get one or two shorter and then Biggie will be done, then what. Back to braids, haha. I kid. I don't know. I love this scarf, it's so warm and soft. 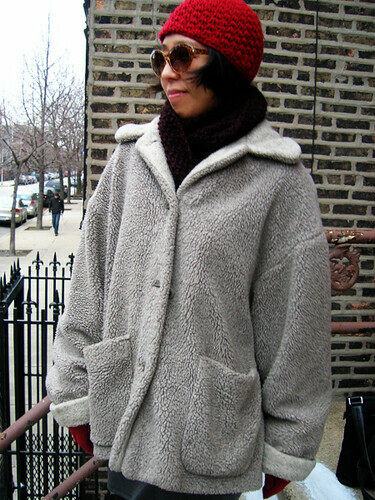 This is such an old, old coat, the lining is mended on the inside with long underwear. I love it even more this year because it kind of looks like the coat that monkey was wearing in the Ikea. Repeat rows 1 and 2 until you have just a couple feet of yarn left, then cast off stitches. If you can work it out, you might like to end so that both tails are on the same edge of your knitting. Fold the scarf over itself and flip one end 180 degrees to form a Moebius strip. So now your tails are on opposite edges of the seam, if you did that. It doesn't really matter, though. Using a crochet hook and the tails, join the two edges together so that the tails overlap in the middle if you're coming from opposite ends. Or whatever. Weave in remaining tails, if anyway.